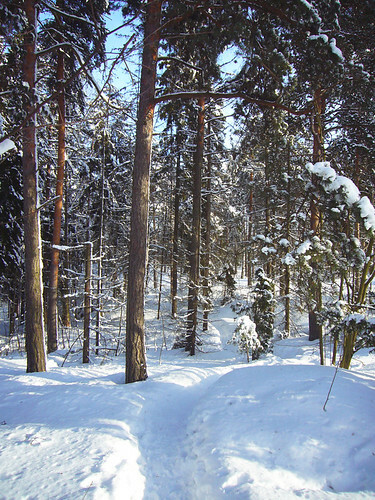 As we are enjoying amazingly bright and brisk winter weather here in Helsinki today, I decided to take a walk in the little forest across the street. So, I dressed in my warmest clothes (it’s fairly freezing outside! ), grabbed my camera and headed off. 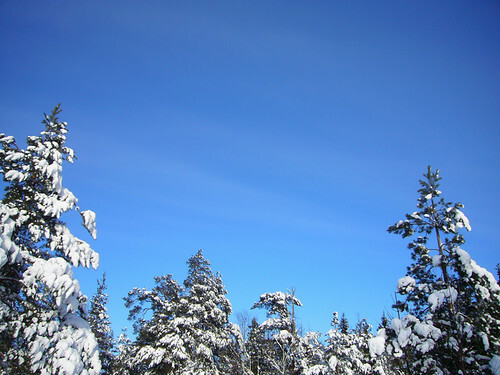 On sunny, very cold days like this, the sky becomes an almost unreal bright blue. The photo above hasn’t been altered in any way (except to resize it), the sky really is that incredible, intense blue. In the forest it looks like the blue sky has dyed all the shadows blue as well, while the snow basking in sunlight is a blinding bright white. And oh, the snow! 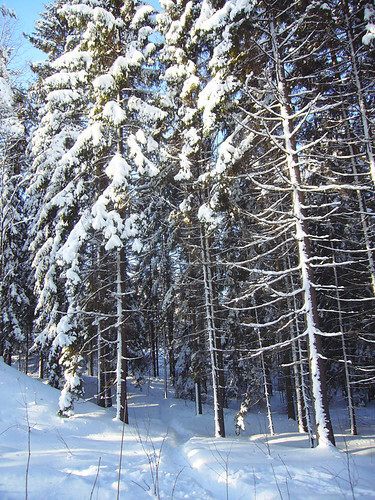 We haven’t had this much snow in decades, and it’s quite impossible to describe the vast, enormous amounts of snow that now cover everything in sight. 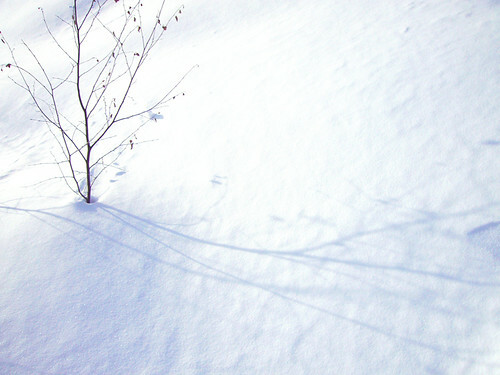 As I discovered when I got a wee bit too excited about taking close-up photos of snow covered trees and ventured off the path, the snow is now very nearly waist deep where it’s still untouched! This great amount of snow has completely changed the landscape, making even the most familiar places look new and different, and the little forest across the street has become a winter wonderland, like something out of a fairy tale. I’m Eerika and I live in Helsinki, Finland. When I’m not getting stuck in snow drifts in enchanted, snowy forests, I make soft toys filled with rags and oodles of personality, draw and take lots of photos of my cat. You can read more about my work and my life over at my blog: Rag Pets. Posted February 11th, 2011 in from the north country. 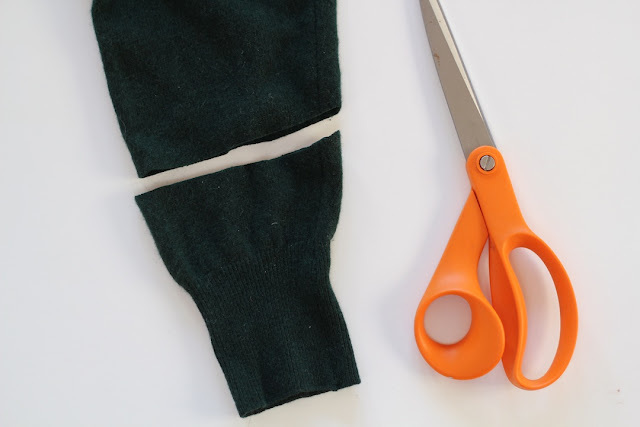 This sweater mitten tutorial from five green acres changed my life this winter. I’ve made about 20 of them, for friends and family. They are satisfyingly quick, economical and most importantly warm. This set was for a family who has an annual camp out on a frozen lake, I have yet to participate but I thought their digits could use some extra protection. Insulated Curtains: a must have for a drafty old house that sees 4 months of winter winds that come from the north. These curtains were really simple to make too. Heavy Ikea fabric and a quilted mattress cover, that had been torn by the washing machine, made for an simple panel curtain. Made a bit longer than the windows so it can be tucked on the sill to keep drafts down. Not the fanciest thing I’ve ever made, but it has made the most difference. Minor improvements every year keep us treading through winter namely a netflix membership and lots of wool. I hope you stay warm too. You can find Lily over at tenfingersworkshop. She blogs about motherhood, sewing, making art and part time homesteading. Stop by for a visit! Thank you meg for letting me guest post for you this week! Posted February 9th, 2011 in from the north country. Posted February 7th, 2011 in from the north country. Cut off the cuff and a couple of inches of sleeve from an old sweater. A sock would work very well too. 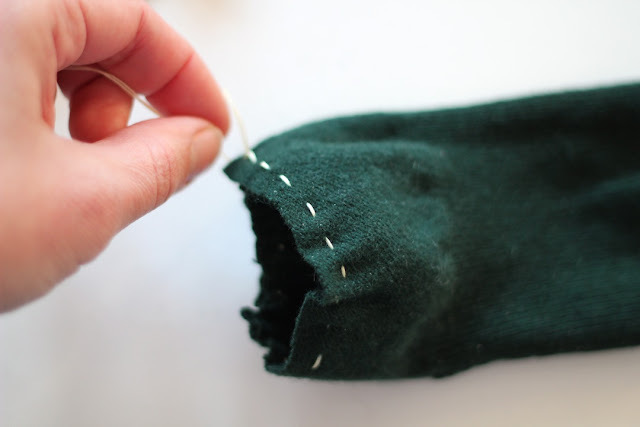 Turn the piece inside-out and do a running stitch about 1/4″ from the cut edge with strong thread all the way around the top. Pull tight and secure with a knot. Turn it right side out and fold up the cuff a bit…hey look, it’s already so hat-like! Now make a little pom pom. There are lots of places to lean how if you have never made one before…like here. I like to felt my pom poms a bit by rubbing them between my hands in warm soapy water. 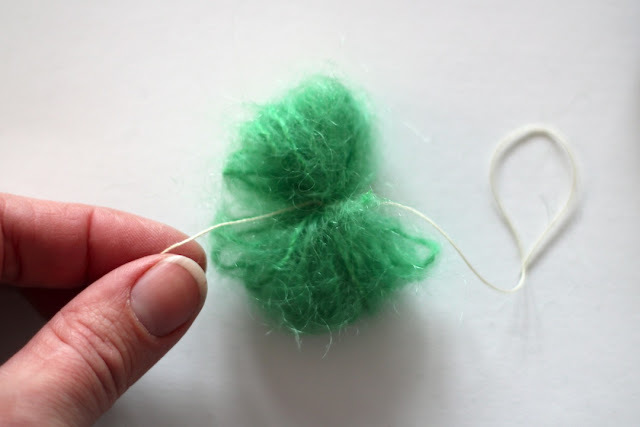 This step is not necessary but I think it looks super cute and helps scale down your pom pom. The yarn must be wool in order to do this step. Now stitch the pom pom to the top of the hat. I’m Erika from Fox and Owl. 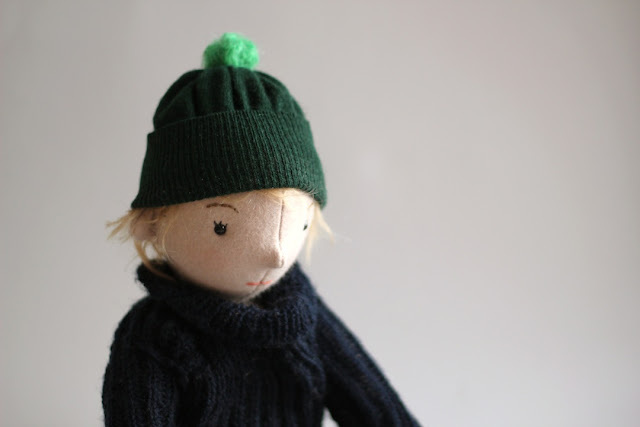 I make dolls and animals and drawings and have a little blog where I talk about art and craft and show lots of gratuitous pictures of my adorable children. Come visit me there sometime! Thank you Meg for letting me be a guest on your excellent blog! Posted February 4th, 2011 in from the north country, tutorials. 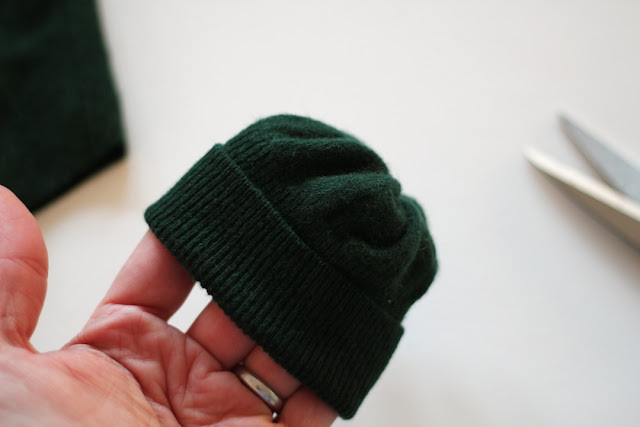 Tagged: guest post, hat, pompom, tiny, tutorial. I’m with Rae (see previous post). I too get a little crazy this time of year when I am cooped up inside for too many days with my kid. When I find my son is doing dismounts from the back of the sofa, the living room looks like the aftermath of small cyclone, and I am contemplating a glass of scotch even though it is barely noon, well, I know it is time to put on our boots and find some distraction outside the house. This is where living in a city comes in handy . Aside from the library, one of our favorite places to visit is the Minneapolis Institute of Art. My boy has been really, really into drawing lately and has been interested in the work of other artists, so on our most recent visit we took along a sketch book and some colored pencils. I told him that when he saw something he really liked, we could grab a seat and he could do some drawings of that piece of art. Now, I admit, I thought he might balk at the notion of slowing our pace through the gallery (because when you are 6 and a boy, it is all about moving at roughly the speed of sound–and maybe throwing a couple of karate kicks in there), but he was actually really excited by this idea. So off we went and you can see some of the resulting sketches. Which brings us to this little tutorial I have for you–it is a scenic patchwork sketch book. And what the heck is that, you ask? Well, just a Moleskine cahier notebook (I used the x-large plain version–they come 3 to a pack) customized with a nice little patchwork of fabrics that together form a scenic sort of design. So the world is your oyster in terms of what you work out for your design here–you can see I did woodland and city themed notebooks below–but it could be anything from outer space to the circus to school…or whatever. Oh, and I also thought I would share the photos of these sketchbooks I made last Christmas as gifts for a few of the kiddies in my life–just because having some options is always nice. They use the same essential technique but are monogrammed with the first letter of the child’s name. Simple. And just remember, if the sketchbook fails to provide enough distraction when you start to get cabin fever and your kids are bouncing off the furniture, there is always scotch (no further commentary necessary, Meg–or Rae). 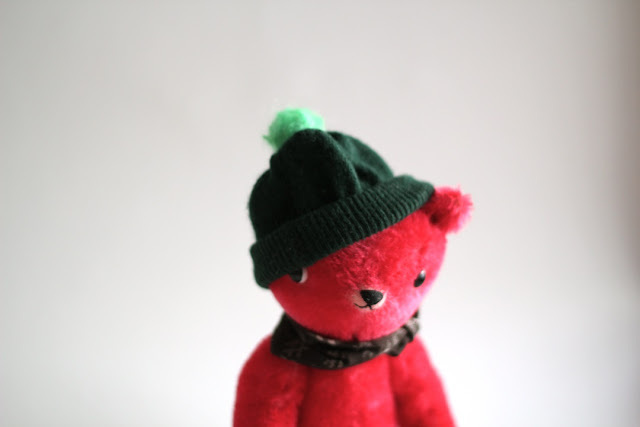 Outfitted with sketchy knowledge of toy design at best and a hand-me-down sewing machine, I began designing plushies back in 2005, naming my little company Beeper Bébé. Today, I design all manner of toys and other things, usually incorporating recycled stuff, and love to share tutorials on my blog. I live in Minneapolis. Future goals of mine include moving to France with my family, becoming a cowgirl, finishing that novel I started writing 15 years ago, learning to quilt, redesigning Little People for Fisher Price so that can be as cool again as they once were, and drinking scotch on my back step—not necessarily in that order though. You can find more of me at: http://chezbeeperbebe.blogspot.com/ and buy the stuff I make at http://www.etsy.com/shop/beeperbebe. Hope to see you around some time. Posted February 2nd, 2011 in from the north country, tutorials. Tagged: art, beeper bebe, guest post, holly, notebook, tutorial.